In December 2014, researchers have spotted new species of deep-sea snailfish swimming at a depth of 8,143m in Pacific's Mariana Trench - which extends nearly 11 km down - during 30-days expedition, named Hadal Ecosystem Studies (HADES) expedition, led by co-chief scientists Jeff Drazen and Patty Fryer of the University of Hawaii. According to news release by Schmidt Ocean Institute, It was a completely unknown variety of white translucent snailfish, which stunned scientists when it was filmed several times during seafloor experiments, had a bulbous head, broad wing-like fins, an eel-like tail and slowly glided over the bottom. This potentially new species of deep-sea snailfish has smashed the previous record for deepest living fish ever recorded on film held by Pseudoliparis amblystomopsis, or the hadal snailfish. 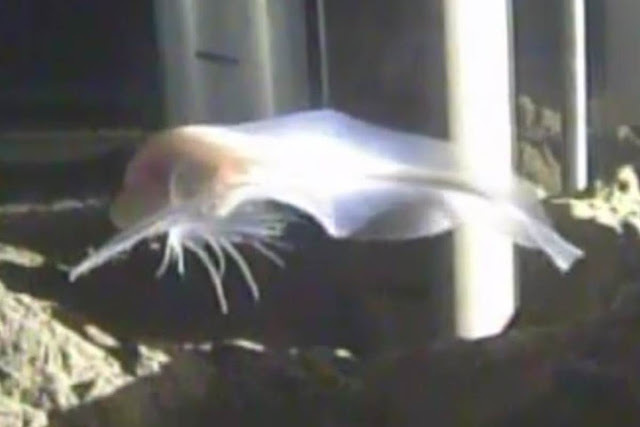 Hadal Snailfish was fist discovered at a depth of 7,700 metres (25,300 ft) in the Japan Trench by a team from British and Japanese institutes in October 2008. Jeff Drazen, a deep-sea ecologist at the University of Hawaii, Manoa, also expedition co-leader says "the roughly six-inch-long (15 centimeters) snailfish sports broad, winglike fins that likely help it search for food. Those fins could be covered in sensors, something like taste buds, that would help the fish detect small animals in the mud." In fact, "we actually saw it strike at something [in the mud] and try to eat it," Drazen says. The researchers drew fish to a deep-sea camera using bait, but had no way to catch it. Without a specimen, they can't give the fish a formal description or scientific name.